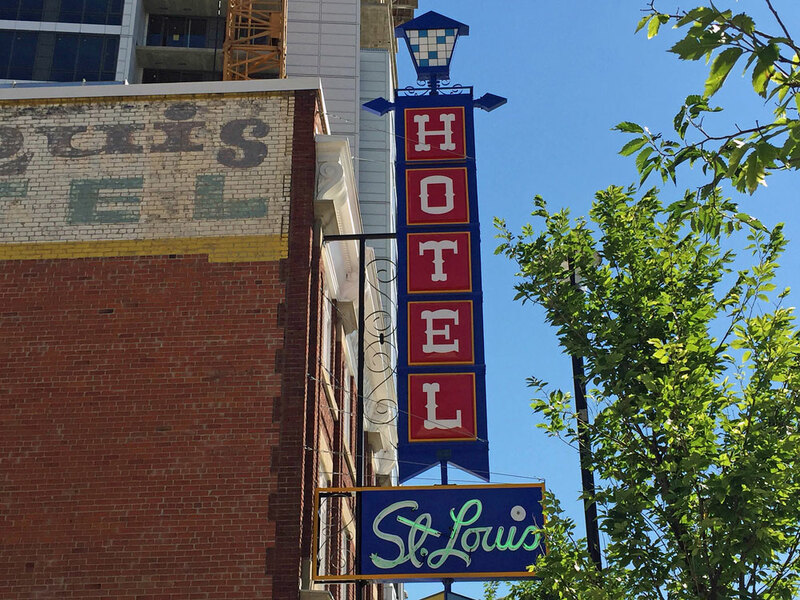 The St. Louis Hotel in the East Village recently reopened following renovations and restorations. While it’s now home to CMLC offices (and more, soon), its storied past is important to remember. George Stephenson Junior shares just a few of the stories of this building before its closure in 2006. Walk through the East Village and you’ll come across across the St. Louis Hotel. Once a seedy hotel with a rowdy bar in the basement, the building closed in 2006. It was recently renovated and restored, and it re-opened earlier this month. Now, it is home to the Calgary Municipal Land Corporation (CMLC) offices. From 1914 until 2006, the atmosphere here was a lot more raucous and a lot boozier. You’ll still find the same neon sign out front that was here before it closed, but changes have been made to the building so that it can stand for at least 100 more years. While the building will stick around, it’s important to remember the character the building once had. George Stephenson Senior, a well-known local entertainer, (and the founder of the venue’s famous indoor horse races), began frequenting the bar in the Louis from the 1950s. His son, George Stephenson Junior, began joining him in the 1980s. We spoke with George Stephenson Junior to hear a few of the stories of the St. Louis’ past. Most of the stories Stephenson Junior shared are from the 1980s. The St. Louis’s claim to fame has a lot to do with George Stephenson Senior. He was an entertainer who also worked in the oil business, and who frequented the St. Louis since the 1950s. “My dad was an entertainer all his life. 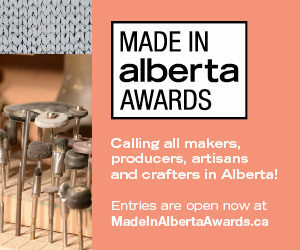 He entertained more than 6,000 shows around Alberta. He did all the police shows, he had been the MC at the Grey Cup, he was the MC at the Bullshooters Breakfast every Stampede for 20 years, he helped out the Flames. He was a musician and a comedian – he was well-known and he loved telling jokes,” says Stephenson Junior. George Stephenson Senior, George Stephenson Junior and a few other men were at the St. Louis on a Friday afternoon in 1985. It was like any other Friday afternoon, except Stephenson Senior came up with the idea of a horse race – it was just a little game for the men at the table. He picked a bunch of imaginary horse names, wrote them down on a napkin, and the men put their initials next to the horse they thought would win. Stephenson Senior was the race caller, calling out the imaginary race as a caller at the Kentucky Derby or the Royal Ascot would. But he made up the entire thing, calling out the results as if he was watching a real race. He also made up which horse won. At the end of the race, the winner had to buy a jug of beer for the table. Stephenson Senior would be staring at his race sheet imagining the horses jostling each other. The crowd would be jumping up and down and cheering. And between the races, Stephenson Senior would be on stage telling jokes. The races were just one part of an hour-long show by Stephenson Senior. From the late 1980s until 2006, the Louis was booming every Friday afternoon. But during the Stampede, the Louis was packed with people for the entire 10 days. Usually, the Louis’ basement would fit about 250 people. During Stampede week though, it was standing room only. Stephenson says they would cram up to 450 people inside. The spot was particularly popular for travelling entertainers looking to make a little pocket money during Calgary’s biggest event of the year. “A lot of the entertainers would play their music, standing on the street corner with a guitar or violin, or they’d whistle or juggle. And lot of them would go down to the Louis [to perform] and they got to know my dad. The musicians really connected with him,” says Stephenson Junior. The Louis’ character and location made it an ideal backdrop for movie scenes. You’ll probably recognize it if you ever watch the 1983 movie Superman 3. Christopher Reeve was filmed sitting at the Louis’ bar and eating a bar snack and leaving the bar in full Superman attire. The film’s producers didn’t try to disguise the Calgary skyline or cover up the St. Louis sign – it’s easy to see that this building was part of this film. The Louis was one of Ralph Klein’s favourite local watering holes. He frequented here before he was premier – according to stories, he was at the St. Louis when he decided to start his political career. (Also according to stories, it was after a few beers.) Stephenson remembers one story in particular where Klein influenced the St. Louis. “Beside the St. Louis was the building’s parking lot, and a lot of people got used to park their car there and then go downtown. We complained about it because we had to park in the City lot behind the building. Instead of being able to walk straight to the Louis, we had to walk all the down the end of the fence to come around. So we mentioned that to Ralph Klein. The very next day the crew came out and put a walkway through so it was easier to get from the lot to the Louis. I think it’s funny that he immediately took care of his drinking hole by putting that walkway in,” laughs Stephenson Junior. The St. Louis basement had one pool table that Stephenson remembers being used a lot and one shuffleboard. And the shuffleboard players were really good. Stephenson says that four of the regular guys he used to sit with every Friday afternoon were the citywide shuffleboard champions for four or five years in a row. Other memorable items on its menu included really, really big cabbage rolls for $1 each, the $3 corned beef sandwich and the kielbasa sandwich on a bun for $1.50. But the St. Louis’ claim to fame were the chicken and chips. Stephenson Junior was out of town when the Louis closed down, but he remembers hearing stories of the big closing event in 2006. “[George Stephenson Senior] was there, Ralph Klein was there and they were wearing T-shirts that looked like tuxedos. Everyone was wearing those T-shirts for the big closing event,” says Stephenson. The Louis’ final day was just like all its popular Fridays over the past several decades. (Except for the tuxedo T-shirts.) The space was packed with people. There was beer and chicken and camaraderie. And George Stephenson Senior did one last run of the world famous indoor horse races.